If you're the owner of a yard, you already know how important soil aeration is for upkeep. Introducing oxygen to the soil by punching a series of small holes in the ground promotes root growth and durability to your lawn, protecting against things like drought and heat stress. With an ALEKO brand steel coring aerator, you can be sure that your lawn is getting only the best. The hollow tines will trap and remove cylindrical 'cores' of soil, which will aerate your yard without impacting the soil. 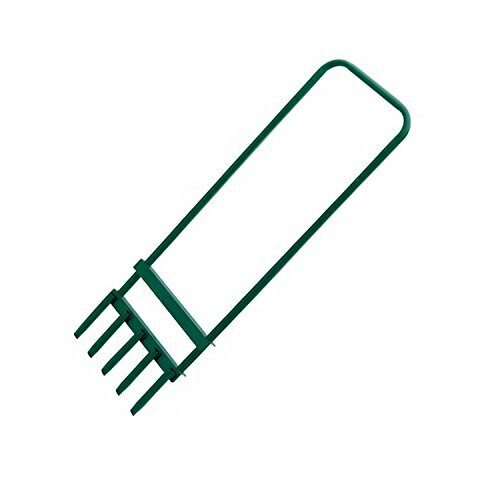 The aerator is a single solid piece of powder coated metal with a series of five coring tines at the end, so it will penetrate even the roughest soil without trouble, and last a long time without needing to be replaced. It emits no greenhouse gasses, saves water, and is ideal for lawns, backyards, and farmland. Best of all, it will save you money! After some time using an ALEKO brand aerator, you'll wonder how you ever got along without it. Product dimensions: 35.5 x 11 inches; Color: Green.